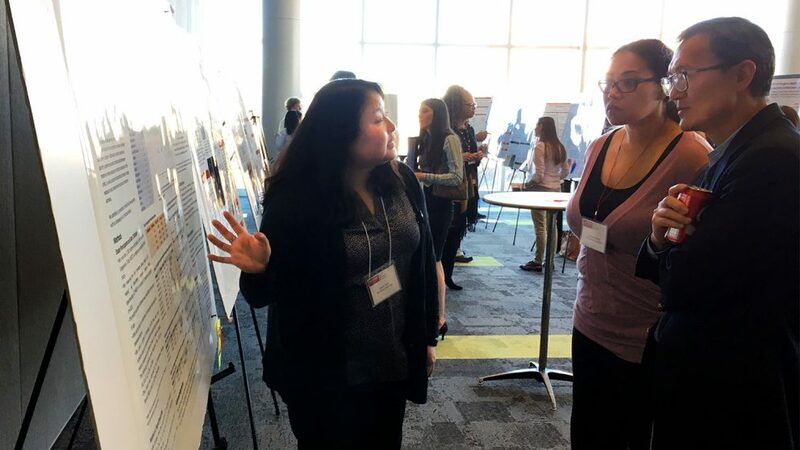 In addition to research presentations, the symposium also included poster sessions highlighting research related to environmental health. Here, Sarah Park talks about her research on the association between first trimester blood metal levels and child BMI in a Durham, N.C.-based research study. Some of Earth’s naturally occurring heavy metals can take a significant toll on human health. That’s why lead, arsenic, cadmium and other toxic metals headlined the first research symposium hosted by NC State’s Center for Human Health and the Environment (CHHE). Showcasing research from CHHE’s members, the Feb. 16 event explored multiple dimensions of humanity’s toxic metal challenge. Because heavy metals are persistent and pervasive in the environment, research is vital to understanding how exposure occurs and the relationship between these toxins and human impacts. Among the ways humans are exposed to toxic metals is through water. Associate Professor of Biological Sciences David Buchwalter spoke about his research on aquatic ecosystems, including the impacts of arsenic and selenium — two heavy metals found in coal ash. One of the United States’ largest sources of industrial waste, coal ash is often stored in wet storage basins nationwide, including North Carolina. “When we combine ash with water, the trace elements come out,” Buchwalter said. His research explores the accumulation and impact of trace metals on periphyton, a biofilm found in freshwater, and the insects for which periphyton is a food source. Other NC State researchers study the impact of toxic metals on human development. Assistant Professor of Biological Sciences Tony Planchart spoke about using zebrafish to explore the effect of cadmium exposure on behavior as well as vestibular systems. The observed impacts of toxins on zebrafish may model human impact, enabling Planchart to “study the link between early exposure and health,” he said. Cathrine Hoyo, an epidemiologist and Associate Professor of Biological Sciences, also researches the connection between toxic metal exposure and human health outcomes. She spoke about the Newborn Epigenetics Study (NEST), which has collected data from about 2,000 Durham, N.C.-area children since before they were born. With data about a child’s heavy metal exposure in the womb, Hoyo can explore the relationship between that exposure and a child’s cardio-metabolic function as he or she grows. Evidence of childhood high blood pressure, high cholesterol and obesity could provide clues about whether heavy metal exposure contributes to early risk factors for disease. NC State faculty also address heavy metal exposure on a global scale. Associate Professor of Soil Science Matt Polizzotto spoke about interdisciplinary efforts to reduce arsenic contamination of water wells in Bangladesh. Specifically looking at solutions for flowing water, experiments include low-cost efforts such as altering the length and width of water channels and filtering water through a new engineered fabric developed in the College of Textiles. “We have this material that can potentially remove large amounts of arsenic,” said Polizzotto, who hopes to test future iterations of the fabric in Bangladeshi water systems. Research related to toxic metals is just one of the areas explored by CHHE’s nearly 90 members, who represent 13 of the university’s academic departments and six colleges. “Our aim is to understand how human health is impacted by environmental factors and to implement this knowledge to reduce the impacts of environmental factors on human health,” said Rob Smart, a William Neal Reynolds Distinguished Professor of Biological Sciences and Director of CHHE. Created in 2011, CHHE received a $6.5 million NIEHS grant in 2015 to become one of 22 centers nationwide dedicated to the study of environmental health impacts. In addition to NC State faculty, CHHE also includes investigators from East Carolina University’s Brody School of Medicine, North Carolina Central University, NC Department of Health and Human Services and National Institutes of Health (NIH) Eastern Regional Comprehensive Metabolomics Resource Core. Published in News, Newswire, Research, Uncategorized, Wellness.